I had an interesting encounter today with a woman named Gail who lives in Hingham (she wouldn't give me her last name). 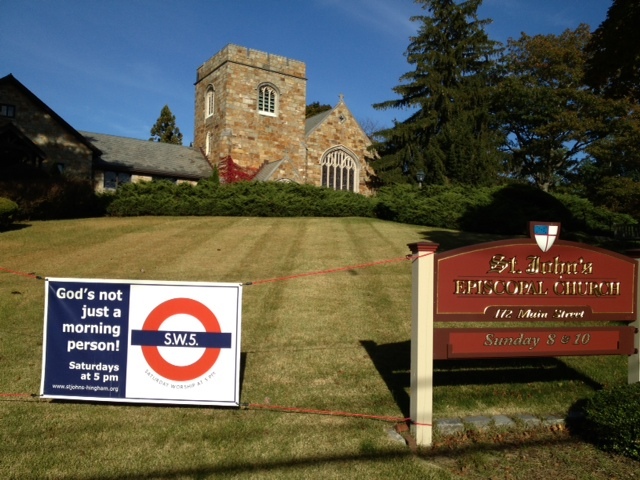 She interrupted me during a meeting ("I just need a minute of your time") to tell me how displeased she was with the sign on the front lawn of the church highlighting our Saturday 5 pm service. She tried her hardest to muster a conciliatory tone ("I don't mean to be disrespectful" and "I've always so admired your church; it's one of the most beautiful buildings in Hingham"). But...there's always a BUT. After trying to get me to tell her that it was just temporary and I'd be taking it down any moment, she pulled out the firepower: "It looks like a used car lot." I responded with "That's the point" and she left. Now, I don't think it actually looks like a used car lot. If you're going to give me that complaint, just check out First Baptist down the street around their fall (or spring -- can't remember) fair. 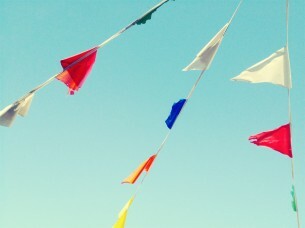 They actually hang those multi-colored plastic flags above their lawn. 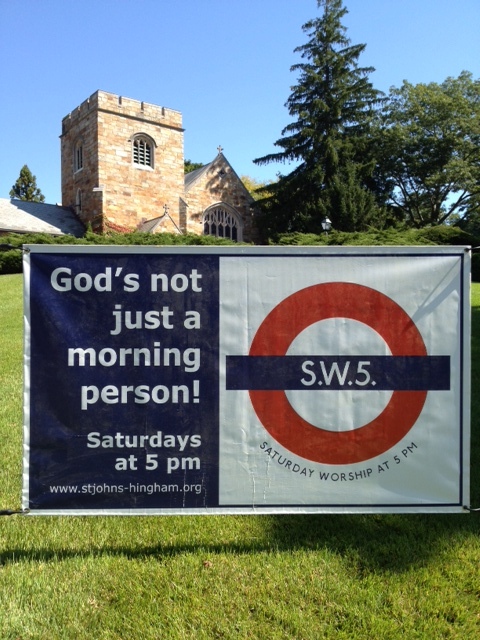 I think our S.W.5 sign is clever, rather discreet church marketing (evangelism!) for a growing contemporary, informal out-of-the-box service (averaging about 35 this fall and trending upwards). proclaimed St. John's banner a "fail"
like an ad for what's free -- or on sale. As the Rev. Maxwell Grant (a Congregational pastor in Greenwich, CT) put it in a reply to my post, "Please have the courtesy to keep your church lovely, unobtrusive, and irrelevant...thanks." And isn't that the prevailing cultural attitude? People don't mind pretty churches in their midst as long as they keep the lawn mowed, don't block my driveway on Sunday morning, do the occasional food drive, and don't ever invite me to participate in your community. They like Christians to be seen but not heard. Well, I apologize but that's not how we do things around here. We really do believe what we say in the ancient Creeds and what we hear of Jesus through Scripture. 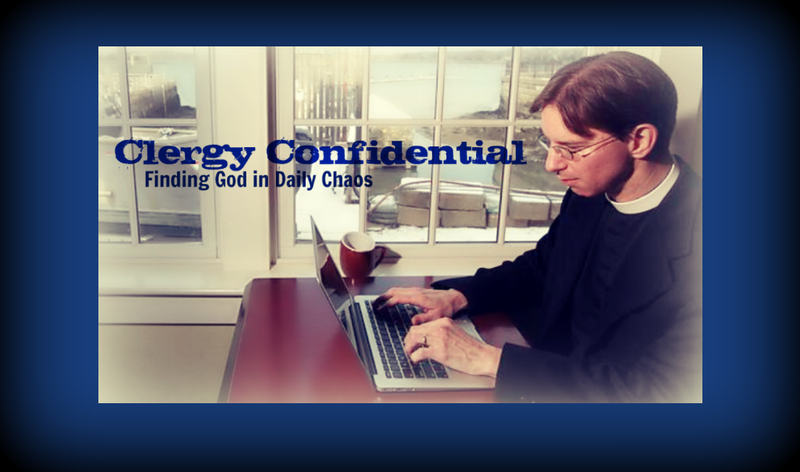 We're called to share this Good News with which we have been entrusted not hoard it. And so I'm sorry if you don't like our sign (don't push me, Gail, or I'll invest in some neon) but it's not going anywhere. What I really should have done was invite her to attend the service next Saturday. Maybe she really was searching for something deeper. Perhaps the sign wasn't so much an affront to her aesthetic sensibilities in driving down Main Street as much as a symbol of brokenness in her life as she seeks something that transcends the visible world. There will always be some disgruntled sourpuss. I'd wonder whether she even belongs to, let alone attend a service at, any church. Keep your sign and pray for her....I'd like to say that's what I'd do but then again, I'm not as sweet-natured as you. Keep the faith, Padre! Might I offer the post I did on complaintments? Seems you've encountered one. Bravo, Tim. I love your conclusion: This could indeed be an indication of the brokenness in her own life, and a cry on some level for reconciliation. Or, as you further point out, she just had a traumatic experience with the Tube. Hard sayin'. Did you tell her how good the coffee is? Maybe she fell down the gap at Bank Station. Father Tim, Seems you a have a nor'easter gale on your hands.... Usually started by too much hot air and low pressure around these locales, though it's been rather chilly lately. At least the faithful use the car (parking) lot a lot.... without the need for deforestation.